No device will ever match the pure music-playing ability of this iPod, with its simple interface, backlit screen, ingenious scroll wheel, and fantastic form factor. These are becoming more and more rare, so grab it while you can. Apple A1051 iPod Mini 4GB Silver MP3 Player Tested w/cords,earbuds & accessories. Tested & Working! Has a bunch of songs on it. Apple iPod Mini 4GB (Gold) Modified to 128GB. The ipod has been tested and is found to be in good working order. Ipod will sync to iTunes. Genuine Apple iPod Mini USB Sync / Charging Cable (not pictured). 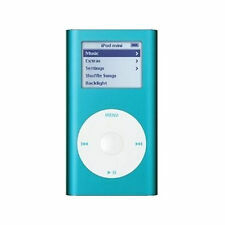 I have for sale APPLE IPOD MINI 2nd GENERATION - 4GB - Pink - A1051 - MP3 PLAYER M9435LL. The Ipod has been tested and works like it should. Works great! Includes two USB cords for charging and downloading. Also includes a white belt clip. Details: All iPod mini models uses a PortalPlayer PP5020 "system on a chip" with dual embedded variable speed 80 MHz ARM 7TDMI processors. Storage: 4GB. Type: iPod Mini. Sale is only for the iPod as shown. Generation: 2nd. 4 GB model holds up to 1,000 songs; supports MP3, AAC, WAV, MP3 VBR, Audible (6), and AIFF formats. Up to 18 hours of battery life. Trending at $30.49eBay determines this price through a machine learned model of the product's sale prices within the last 90 days. Excellent condition - body and screen are clean with almost no marks. No accessories included, you will receive exactly whats pictured. Minor wear from use! Included USB cable only! No wall adapter or other accessories! Has some wear to body and screen from use! Tested and works great! An expertly refurbishedApple iPod mini | 1st Generation, 4GB, Silver (M9160LL). iTunes 4 lets you organize your music on your Mac or Windows PC and automatically transfer it to iPod mini. Your iPod mini includes both a FireWire and a USB 2.0 cable for high-speed transfer from your Mac or PC. Loaded with 1195 songs. Faults and defects as well as highlights are described. IPOD IS IN GOOD VISUAL AND TECHNICAL CONDITION. THIS BUNDLE IS FOR THE PLAYER AND BELT CLIP ONLY. HEADPHONE JACK CHECKED. Battery life is estimated at eight hours of music playback and it provides 25 minutes of skip protection. 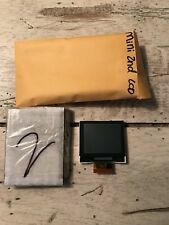 This LCD fits 2nd Generation iPod Mini only. Does NOT 1st Gen players. Nano 2nd Generation (2 GB). Mini 1st Generation (4 GB). General Condition for both is For parts or not working. Up for sale is PARTS ONLY Apple 4GB iPod Mini - 2nd Generation Pink A1051 NOT WORKING. NOT WORKING PARTS ONLY. Minor signs of light scuffs. Vintage Apple iPod Mini MP3 + Box PINK Metal Works Great !! Tested, Works Great. Phone shows sign of usage. NO other accessories. Not sure what generation. It used to work but now it does not and should still have media on it. It is engraved with DJ Samnizzle. Just thought maybe someone might want to fix it or use the parts. Will be shipped in a bubble mailer. Again this iPod is being sold for Parts or Repair. For Parts or Repair. For parts or not working. Condition Notes This item is sold AS IS, and no warranty given. Used Untested Apple iPod Mini 2nd Generation (4GB) A1051 EMC # 2044. Model: - iPod mini (2nd Gen). Again this iPod is being sold for Parts or Repair. Build Week - Your device was built in week 33 of that year (August). Storage Capacity: 4GB Model Generation: 2nd Generation Type: USB MP3 Player. Country/Region of Manufacture: Unknown Product Line: iPod Mini. For parts or not working:An item that does not function as intended and is not fully operational. This iPod has been tested and is in working condition. The original contents hasn't been erased. Sold AS IS. This MP3 player is sold in a good but used condition and is not working. This MP3 player can be used for parts or maybe it can be repaired properly. Included with the sale of this MP3 player is a thin rubber sleeve cover, a Timberland fabric protective cover, and an original Apple charging cable. Parts only - shows language setup screen when plugged in. All proceeds go to charity: The Blind Center of Nevada!